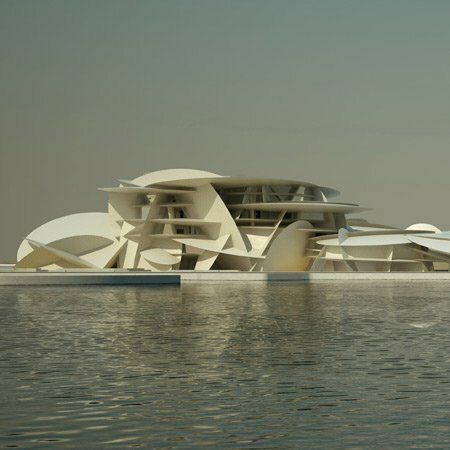 French architect Jean Nouvel has unveiled his design for the new National Museum of Qatar. The museum will comprise a series of interlocking discs of varying dimensions and curvatures, which will form walls, ceilings, floors and terraces. Each disc will be made of a steel truss structure clad in glass-reinforced concrete and the voids between discs will be glazed. This new structure will be built around an existing palace. Jean Nouvel’s design manifests both the active, dynamic aspect of the Museum’s program and its crystallization of the Qatari identity, in a building that, like a desert rose, appears to grow out of the ground and be one with it. Prominently located on a 1.5 million-square-foot site at the south end of Doha’s Corniche, where it will be the first monument seen by travelers arriving from the airport, the building takes the form of a ring of low-lying, interlocking pavilions, which encircle a large courtyard area and encompass 430,000 square feet of indoor space. One of the world’s most highly respected architects, whose achievements have been recognized with the Gold Medal of the French Academy of Architecture, the Aga Khan Award for Architecture, the Praemium Imperiale and the Pritzker Prize, among others, Jean Nouvel was born in Fumel, France, in 1945 and has headed his own architecture practice since 1970. Among his most notable buildings are the Arab World Institute, Fondation Cartier and the Quai Branly Museum in Paris, the Opera House in Lyon, the Symphonic House in Copenhagen, the Guthrie Theater in Minneapolis, the Dentsu Tower in Tokyo, the Agbar office tower in Barcelona, the Culture and Congress Center and The Hotel in Lucerne, Galeries Lafayette in Berlin, the Justice Center in Nantes, the extension of the Reina Sofía museum in Madrid, and the 40 Mercer Street and 100 Eleventh Avenue apartments in New York.